APPEARANCE PACKAGE -inc: Rear Door Heated Windows w/Wipers/Washers, Bumpers Painted In Vehicle Color, Courtesy Light For Liftgate Door, Roof Rails, Plastic Full Wheel Cover, 7J X 17", Heated & Electrically Adjustable Exterior Mirrors, Cruise Control, Rear Door Liftgate, Rain Sensor, Wheels: 17" Steel, Vinyl/Rubber Floor Trim and Board Trunk Lid/Rear Cargo Door Trim, Urethane Gear Shift Knob, Tunja Fabric Seat Trim, Transmission: 7G-TRONIC 7-Speed Automatic -inc: standard shift paddles, Transmission w/Driver Selectable Mode, Sequential Shift Control w/Steering Wheel Controls and Oil Cooler, Trailing Arm Rear Suspension w/Coil Springs, Towing Equipment -inc: Harness, Tires: 225/55R17 AS. 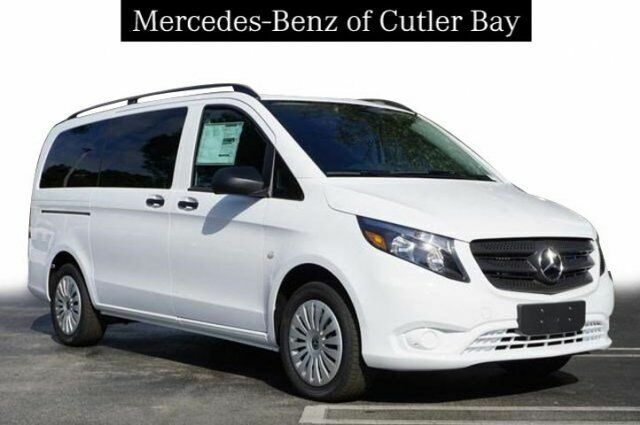 This Mercedes-Benz Metris Passenger Van has a powerful Intercooled Turbo Premium Unleaded I-4 2.0 L/121 engine powering this Automatic transmission. Strut Front Suspension w/Coil Springs, Streaming Audio, Steel Spare Wheel, Split Swing-Out Rear Cargo Access, Sliding Rear Doors, Single Stainless Steel Exhaust, Side Impact Beams, Seats w/Vinyl Back Material, Rims Painted In Black, Removable Third Row Seats, 3-Places, Removable Second Row Seats, 2-Places, Remote Keyless Entry w/Integrated Key Transmitter, 2 Door Curb/Courtesy and Illuminated Entry, Regenerative 190 Amp Alternator, Rear-Wheel Drive, Rear HVAC, Rear Cupholder, Rear Child Safety Locks, Radio: Audio 15, Radio w/Seek-Scan and Clock, Power Door Locks.